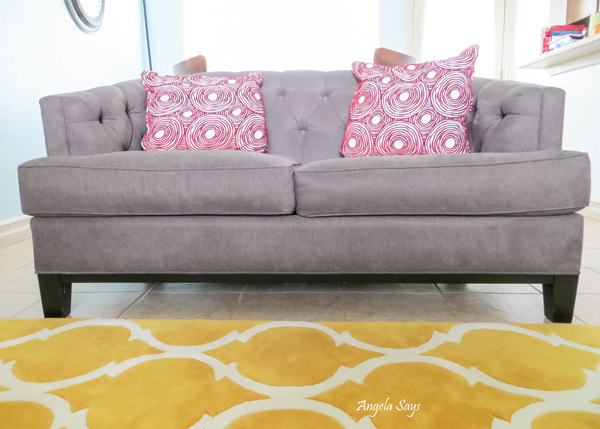 I actually use the same tips and tricks to keep my white sofa clean as I do on my other furniture and I’m gonna share 7 easy tips to clean a sofa or couch. 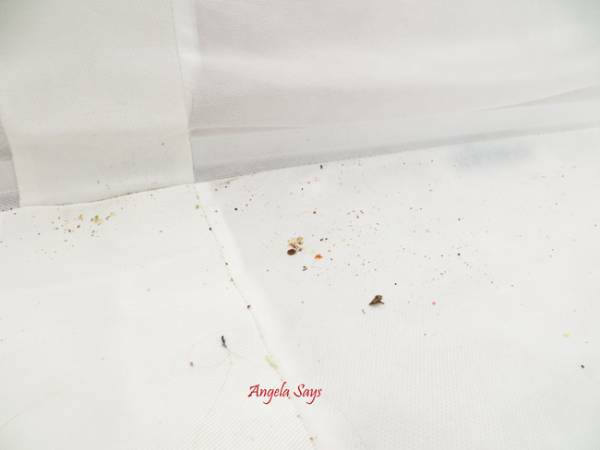 Seriously, vacuuming regularly removes the big chunks of …food… and more importantly the smaller particles that can deteriorate the fabric fibers over time. I also tend to find things I’ve lost when I clean my couch like nail clippers, remotes, and lonely left socks. 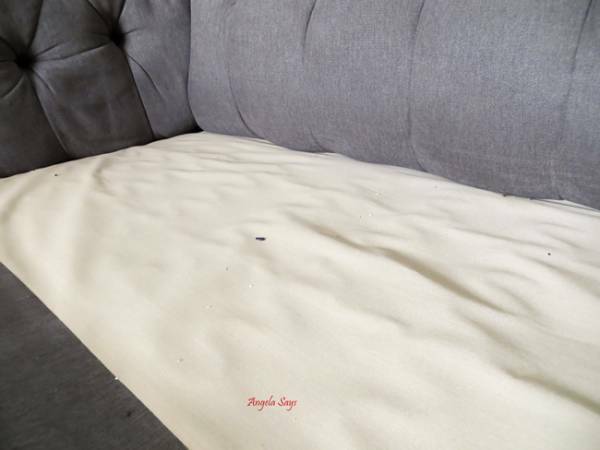 My white couch collects fuzz like non other while my microfiber couch looks worn after a week. By using the upholstery attachment, the bristle help to lift stubborn particles and the couch fibers. I would recommend doing this at least once a month, or whenever they start looking uneven, that’s what I do. Since this is a love seat, I have to rotate them almost weekly since the cushion on the right is sit on more often than the one on the left as you can see. Occasionally pizza sauce is spilled on the couch you’re not supposed to eat on (I know, we have issues) and it’s best to deal with spills and stains when they happen. However, since we live in a world with children and husbands, another great time to get to them is when you find them. 🙂 I tend to favor SuperSpotter as it is an all natural product and it works really well on food stains, like chocolate. However, cool soapy water works well too. After removing all of the cushions from the couch for vacuuming, lean them up against the couch and let them air out. A fresh smelling couch can make your couch seem cleaner too. Use your favorite deodorizing spray, or, if you can, take the covers off the cushions and throw them in the wash. Fluff throw pillows to air them out and to help them regain their original state. 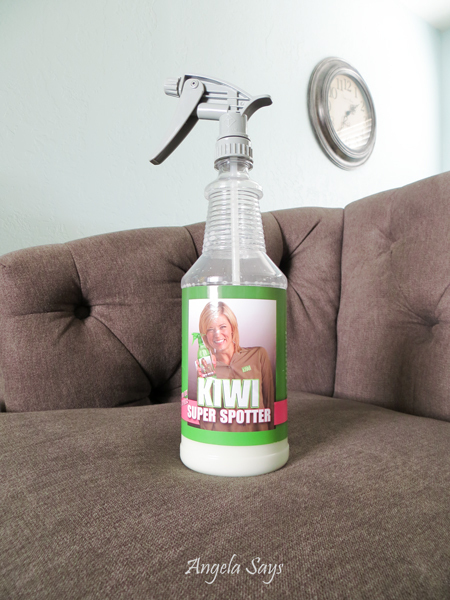 This is my best friend when it comes to keeping my sofa and couch clean. I may have done three light coats on the white couch to help repel the inevitable stains. If you have a professional clean your furniture, I would definitely recommend having them apply a protectant to keep your furniture cleaner. Even if it only lasts for a minute, put the cushions and throw pillows back onto your couch so it looks like it belongs in a showroom. 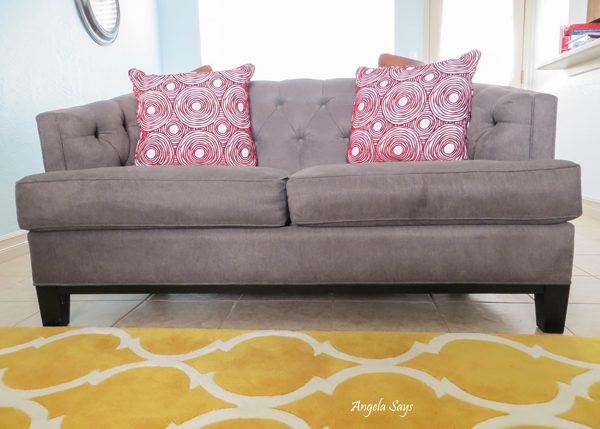 Staging, putting your sofa back together isn’t really cleaning it, but it is cleaning the room around your sofa, making it look cleaner by default. Keeping a sofa clean is really pretty easy but if all you have time for is to clear off is the papers or dishes, that’s a start. These tips are what work for me and help my couches last longer and I encourage you to do what works for you. Oh by the way, I’m doing another giveaway, courtesy of KIWI Services! 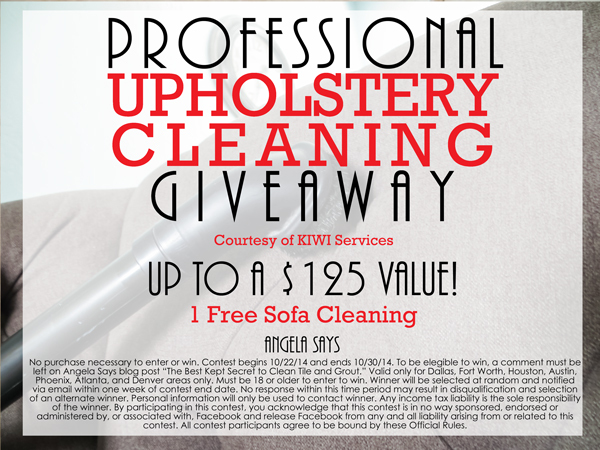 This week I’m giving away an upholstery cleaning of up to $125 and all you have to do is leave a comment and live in Dallas, Houston, Fort Worth, Austin, Atlanta, Phoenix or Denver metro area. The giveaway ends on 10/30/14 and the winner will be contacted by KIWI Services and announced here on the blog. No purchase necessary to enter or win. Contest begins 10/22/14 and ends 10/30/14. To be eligible to win, a comment must be left on Angela Says blog post “The Best Kept Secret to Clean Tile and Grout.” Valid only for Dallas, Fort Worth, Houston, Austin, Phoenix, Atlanta, and Denver areas only. Must be 18 or older to enter to win. Winner will be selected at random and notified via email within one week of contest end date. No response within this time period may result in disqualification and selection of an alternate winner. Personal information will only be used to contact winner. Any income tax liability is the sole responsibility of the winner. By participating in this contest, you acknowledge that this contest is in no way sponsored, endorsed or administered by, or associated with, Facebook and release Facebook from any and all liability arising from or related to this contest. All contest participants agree to be bound by these Official Rules. Sorry, but I did not see a white couch !!!!! Best way to keep a sofa clean, is NEVER eat on it in the first place…..the kitchen is for eating….I never let my kids eat on the couch or run thru the house with cookies in their hands…..they know to eat in the kitchen and at the table…..then when they are finished eating, they go play…..this is the easiest way to keep your couch clean…..my couch is probably over 10 yrs. old and looks like a new one….no dirty spots on my couch…..I just can’t believe people would let their kids eat pizza, etc. on a couch….. I do agree on most of your suggestions! and let me say one thing, our house is for us to live in it! life is not about telling our children to eat here and not there and be afraid of dirty spots all the time! accidents happen and we clean them off course!so thank you for all the time you spend writing these tips, I enjoyed your post! I agree, thanks for the tip LadyDi! I have dogs and you can imagine what happens when I bought new sofa last week. Thanks for sharing the steps in which I should clean the upholstery of my sofa! Thanks! Thank you for your advices about the sofa cleaning. I want to buy a new sofa for my living room and I will definitely follow your tips with the cleaning part. Keep going with the great advices! Thanks for your tips. I think it’s very helpful with my sofa. I wil try it. Fantastic tips. I have white sofa in my living room,too. I rotate my cushions often. Actually I am trying to teach my children to do this. It is very pleasant when your cushions are in good shape. Best regards! Kiwi is a great product. It is fantastic for spot cleaning. I spilled tomato sauce on my sofa and I managed to clean it for 20 minutes. It was miracle. Thank you ! Dealing with stain when it happens will ensure that it doesn’t take time to soak in. If you leave the stain unattended, it is probably going to be much harder to clean up. Then you run the risk of a dirty and smelly couch! I really like your advice to vacuum regularly. I think that seems very easy, but we often forget how important it is. Do you have any other tips about caring for your upholstery? I really just want to be sure that I’m maintaining it properly. Hello, this is very nice blog, I have learn a lot of thinks through your article. I am very happy to your blog it’s very helpful for everyone. 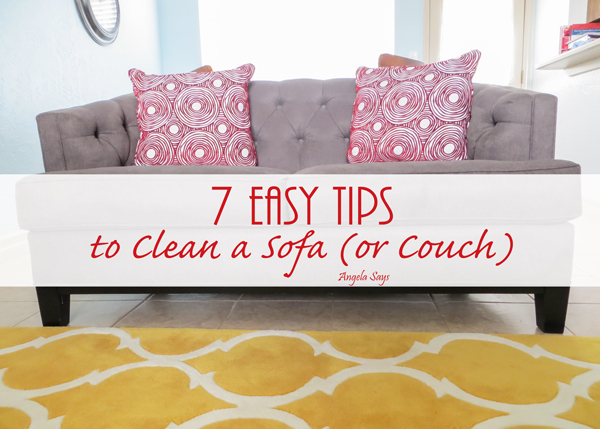 Thanks for sharing these tips for a clean sofa! I was actually unaware that you should let cushions air out by leaning them against the couch. I’d be interested in learning specific cleaning tactics that are used depending on the material of the couch. It’s good to know that when it comes to cleaning a couch that one thing we need to remember to do it to air it out and fluff. I like how you mentioned that this will allow the couch to smell fresher and allow it to look cleaner. If this is something that we will have to remember to do next time we deep clean the house but we also might want to have a professional come in to clean it to help keep it looking nice. I like what you said about how you should deal with stains as they happen, but I’m always afraid that I’ll make it worse. For instance, my husband accidentally spilled chocolate on our sofa, and I’m too scared to even dab at it. Your DIY tips are great, but I think I’ll have a furniture cleaning company take care of my stain just to make sure it’s completely gone. I like that you provided some tips on how to clean your sofa such as by vacuuming regularly. It is recommended to vacuum your sofa regularly to remove leftover food particles, dust, and dirt that may have accumulated over time. This can also help remove some artificial stains on your fabric. Plus, you may even find some of your long lost valuables such as your keys! I would make sure to keep this in mind when I do my regular furniture cleaning. Thanks. 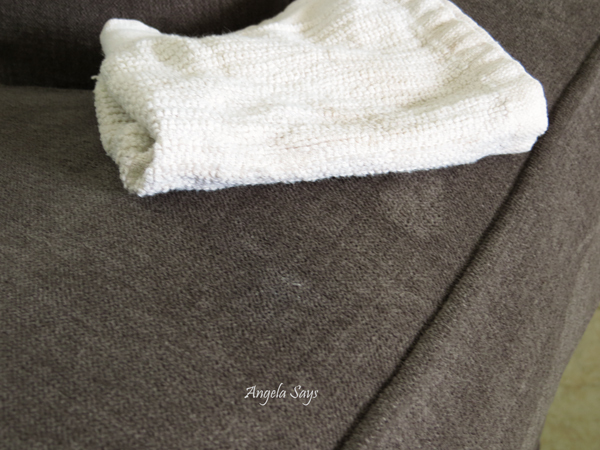 thank you for the tips to clean a sofa. the blog is very helpful. Upholstery cleaning is one of the toughest task. Thanks for sharing such a helpful blogs . Thanks for sharing such wonderful blog regarding upholstery cleaning.